(Newser) – If it sounds like an unusual event, that's because it is: A North Korea solider was shot and wounded in the demilitarized zone Monday afternoon while trying to defect to the South. The bullets came via "his former comrades," as CNN puts it, and struck him in the shoulder and elbow, reports Yonhap. Per the South Korean military, he was recovered unarmed and bleeding some 25 minutes after gunshots were heard. 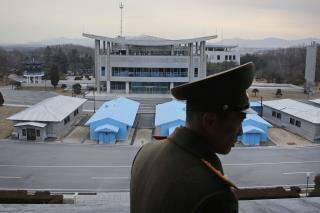 A UN Command helicopter removed him from the area and transported him into South Korea for treatment. He's just the seventh soldier to defect since 2012, though the third this year. You think this action is peculiar to North Korea? Ever hear of Fragging? A shoulder shot? Not very good aim.